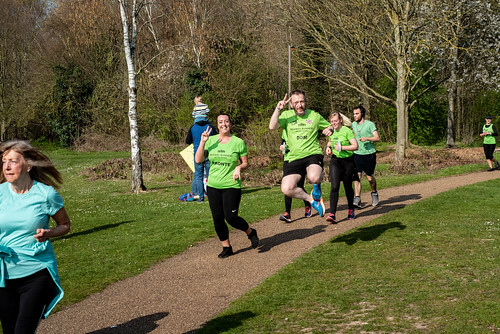 Well the sun certainly shone for the Redway Runners beginners’ graduation today – unlike the graduation this time last year when it was bitterly cold and we were still reeling from “The Beast from the East!” The glorious weather brought out 903 of us to walk, jog and run around the course - a record number for a Saturday parkrun. The previous record was set on Tuesday 1st January this year when 918 turned up for a New Year’s Day run. 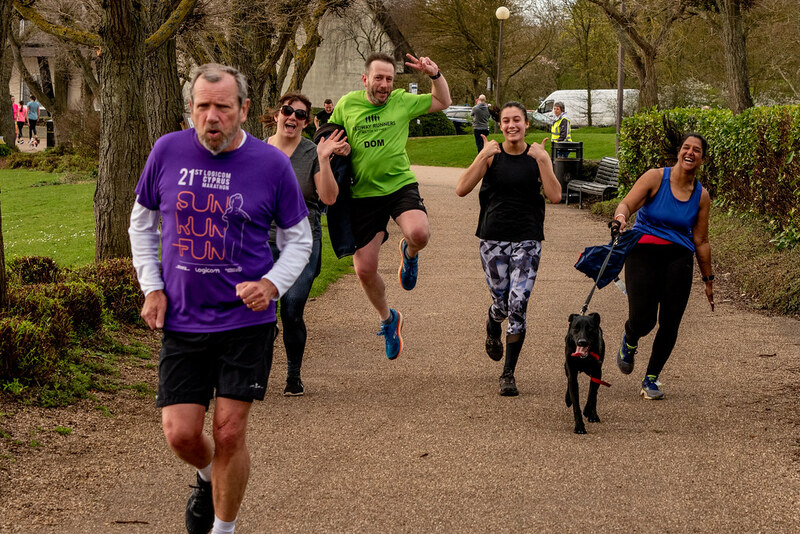 Milton Keynes was in fact the fourth largest parkrun in the UK this weekend, coming in behind Bushey Park (1422), Southampton (1006) and Cannon Hill (952). 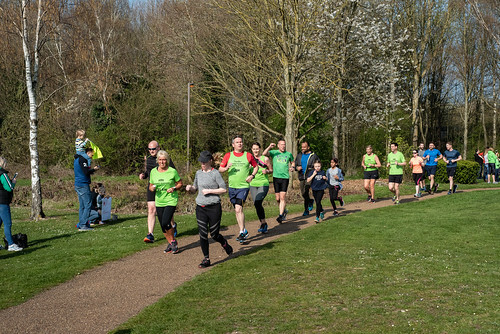 We have some amazing statistics for today, with 132 recording a PB and 186 first timers – the majority of the first timers coming from the Redway Runners beginners’ courses. Hope to see you all again next week! Another amazing statistic is that nearly 8% of today’s runners didn’t have a barcode or chose not to be scanned! That is quite a lot – and some of that 8% didn’t hand their token back! If you find a parkrun token in your back pocket, then PLEASE return it!! Gareth was so excited about his new set of tokens a couple of weeks ago and these have only been used twice – we can’t lose them so soon. I couldn’t hear if any tourists declared themselves today as I was right at the back of the crowd, but I do believe there was one from Derbyshire and one from Wales, as well as the usual relatively local tourists. Lots of people earned their milestone t shirts. 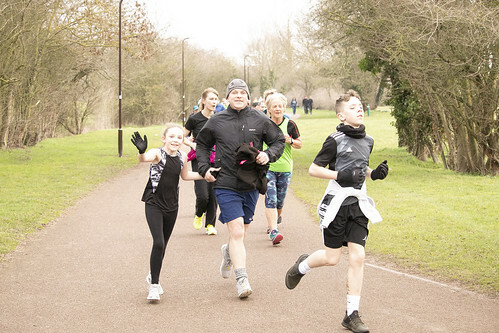 We had two juniors reaching their 10th parkrun and both of these celebrated their achievement with a new PB – so well done to Megan FIDLER and Anish KUMAR. 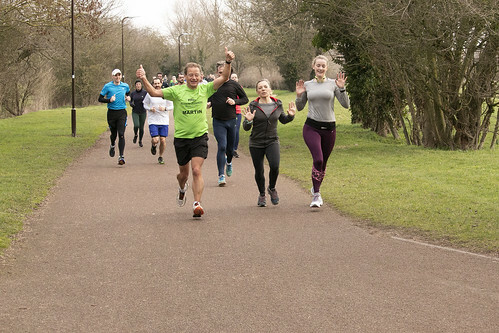 Three people celebrated their 50th parkrun – Clive BIDDULPH, Shaunak NAVALKISSOR and Meg PIKE, two celebrated their 100th – Louise CRANSWICK and Ruth LYNCH, while Kevin GARDNER will be collecting a t shirt for his 250th parkrun. Well done to all of you! 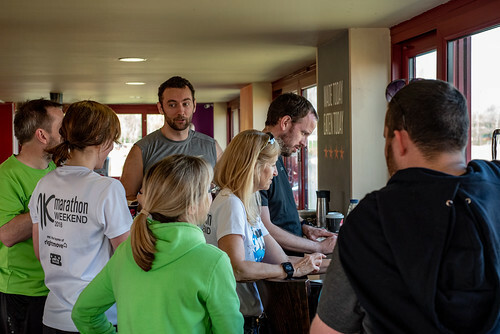 I am also claiming a parkrun t shirt this week as this was my 25th volunteering day which led me to wonder how many free t shirts parkrun give out each week for all the different milestones. Turns out it is 1900 a week!! If you consider that they provide milestone t shirts across six different categories and each category needs lots of different sizes, then they have 82 different t shirts in stock!! I think Dom’s jump is higher than the one captured last week! Sam WINTERS (SM25-29) from Marshall Milton Keynes AC was first to finish in 16.18 knocking almost 2 minutes off his only ever parkrun in December last year. Richard ASHTON (VM50-54) from Marshall Milton Keynes AC was second to cross the line in 16.46 knocking 17 seconds off his previous PB. Ian Stuart WOOD (VM35-39) was third to finish in 16.55 knocking 25 seconds off his previous PB. Lucy STEVENS (JW15-17) a first timer from Rugby and Northampton AC was second to cross the line in 20.47. Sarah GREEN (SW30-34) a first timer from Thame Runners was third to finish in 20.49. This week we had two runners with an age graded score over 80%! And I will leave you with a couple of behind the scenes pictures of some of our volunteers this week. Well done to everyone who took part this week! 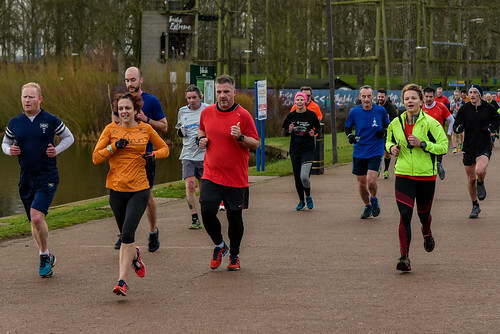 Today's full results and a complete event history can be found on the Milton Keynes parkrun Results Page . 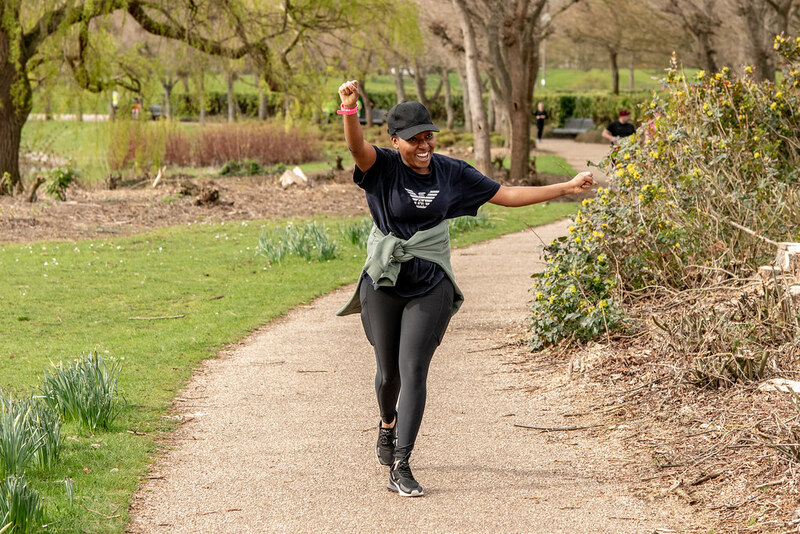 This week 903 people ran, jogged and walked the course, of whom 186 were first timers and 132 recorded new Personal Bests. Representatives of 36 different clubs took part. 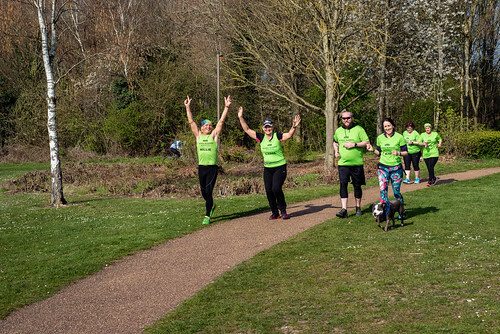 Another perfect day for a parkrun saw 615 of us turn up to run, jog or walk round the Milton Keynes parkrun and 143 of you recorded a PB. 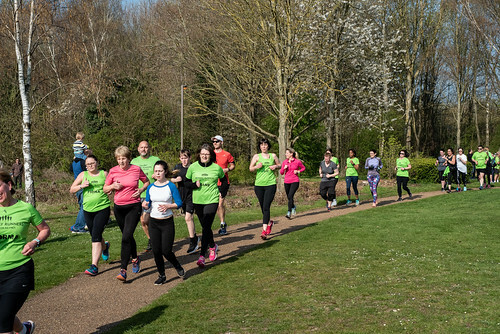 29 people completed their first ever parkrun and a further 26 completed their first at Willen. After a quick trawl through the running clubs it seems we had a huge number of local tourists but the only one I could see who really travelled far came from Sheffield! 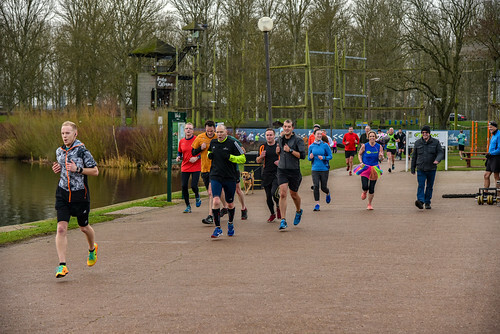 Today I completed my slowest ever parkrun, having decided to walk it ahead of my first half marathon the following day I was not alone – I do think there are more people choosing to walk parkrun recently and it’s great to see everyone out there enjoying our wonderful scenery at Willen. This week was not without incident! 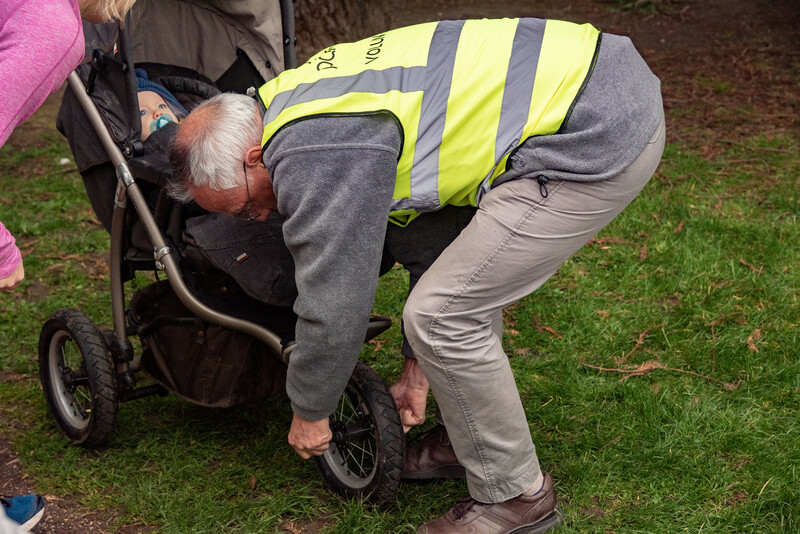 The front wheel fell off a buggy at the start of the event – fortunately one of the volunteers was able to fix it and Adrian was around to photograph the event! Hope they made it to the finish! We had four people celebrating their 50th parkrun today – Duncan GRAY, Max MCCAFFREY, Angela MONZIONE and Gina PENN – well done to all of you. 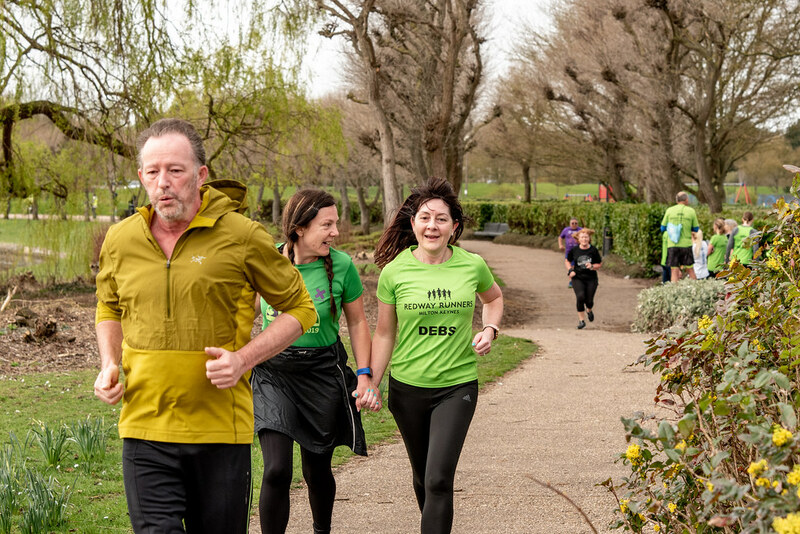 Christopher MAHONEY celebrated his 100th and Lindsey O’KANE celebrated an unofficial but impressive 200th parkrun. Well done to all of you! We had a couple of good jumping shots today so thought I would share them with those of you who haven’t checked the photos out on flikr yet. I have considered jumping for a photo myself but am fairly certain I would end up inelegantly sprawled at Adrian’s feet! Best leave it to the experts! Mintu SIDHU (JM15-17) was first to finish in 16.29 – knocking an impressive 28 seconds off his previous PB. Alex SMITH (SM25-29) from Harpenden Arrows Running Club was third to finish in 18.20. Philippa FANCOURT (VW40-44) was first to finish in 19.55 (16th overall) with a new PB – an amazing 11 minutes off her only other parkrun nearly two years ago! Sarah BIRD (VW45-49) from Redway Runners was second to cross the line in 20.55 (29th overall). Saskia CHAPLIN (JW11-14) from Olney Runners was third to finish in 21.06 (34th overall) knocking 3 seconds off her previous PB– she just gets faster each week! And finally – look how happy our tail walkers are! 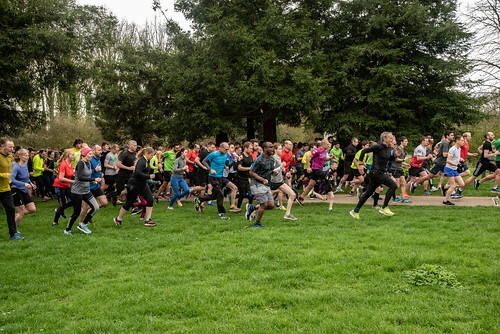 Today's full results and a complete event history can be found on the Milton Keynes parkrun Results Page. After marshalling at today’s parkrun I found myself walking back to the start along with two tail walkers and five other marshals. 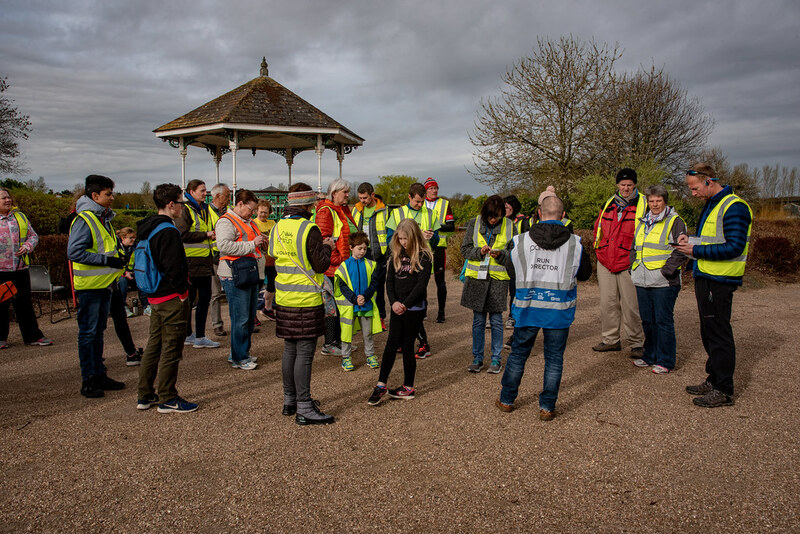 Our conversation covered many topics – not all suitable for a parkrun report - but we did get to wondering what the collective noun for a group of marshals should be? After much discussion we decided on flock of marshals after the geese on Willen Lake. Of course, I had to do some further research when I got home and found some very entertaining ones. How about a drunkship of cobblers (what does that say about cobblers?) or a bloat of hippopotami? My favourite would have to be a wheeze of joggers! Anyway, back to the marshals – how about a band of marshals – we are a group that meets at the bandstand! I would welcome your suggestions! 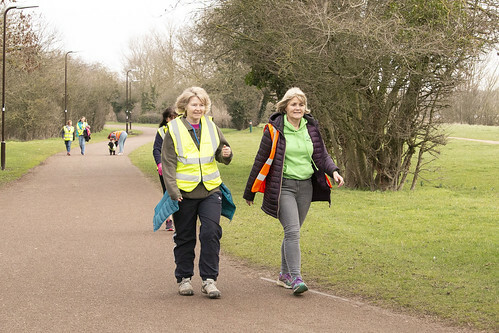 Today 566 of you turned up to run, jog or walk round the Milton Keynes parkrun and 96 of you recorded a PB. 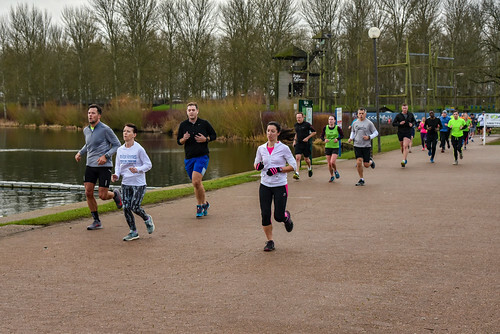 21 people completed their first ever parkrun and an additional 23 completed their first at Milton Keynes. There were tourists from Birmingham, Daventry, Finsbury Park and Stevenage but sadly no photographer today so no photos to brighten up the report. We had one junior celebrating his 10th parkrun today – well done to Jack WILKINSON. We also had Linzi ALLEN and Jason CARVALHO collecting their 50th t - shirts and Gwilym JAMES achieving his 100th. Well done to all of you. Richard ASHTON (VM50-54) from Marshall Milton Keynes AC was first to finish in 17.47. Richard has run three parkruns this year and that was first time as first finisher! Alex SMITH (SM25-29) from Harpenden Arrows Running Club was second across the line in 17.57. Nearly half of Alex’s 109 parkruns have been at Milton Keynes and this was his fastest time here this year. Chris ENGLAND (SM25-29) was third to finish in 18.26. Chris has been parkrunning regularly for just over a year and has knocked two and a half minutes off his PB in that time. Saskia CHAPLIN (JW11-14) from Olney Runners was first to finish in 21.09 knocking 5 seconds off her PB from last week – there seems to be no stopping her! 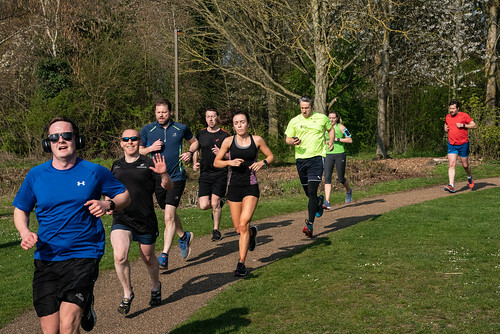 Sophie OLEJNIK (SW25-29) from WS Runners was second across the line in 22.15 – her best position at Milton Keynes parkrun. The female record is held by Emily TALLEN who recorded a time of 17:04 on 29th October 2011 (event number 94). The male record is held by Ian KIMPTON who recorded a time of 15:01 on 27th July 2013 (event number 182). The Age Grade course record is held by Angela COPSON who recorded 95.57% (22:33) on 6th February 2016 (event number 311). Milton Keynes parkrun started on 16th January 2010. 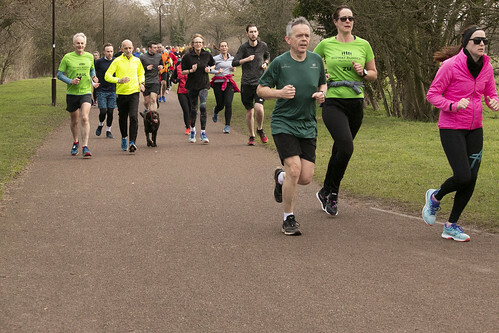 Since then 18,771 participants have completed 168,510 parkruns covering a total distance of 842,550 km, including 28,897 new Personal Bests. A total of 1,859 individuals have volunteered 11,094 times. When I write the run report, I like to be at the start to hear if there are any milestones or tourists declaring themselves – and as my husband would say “soak up the atmosphere!” However today I was marshalling at the top of the zig zags as well so didn’t hear the pre-run talk. Usually the Run Director asks any first timers present if they are likely to complete the course in under 17 minutes - I have never heard anyone say yes! If the answer is no then you can just follow the crowd! Only this time there was someone who said yes so he didn’t know the way! Well there I was at the top of the zig zags, minding my own business when the first runner hurtled up towards me asking “Which way?” I was so startled that I could only point – I hope I didn’t cause him to lose any seconds as he had to turn sharply and go down towards the Peace Pagoda. 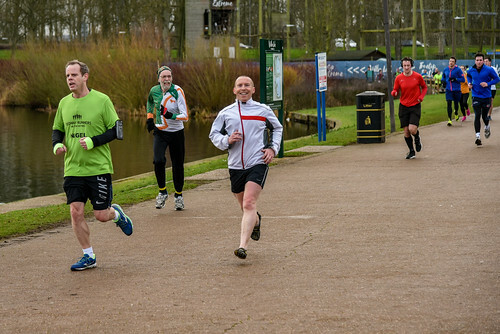 Today 559 of you turned up to run, jog or walk round the Milton Keynes parkrun and 75 of you recorded a PB. 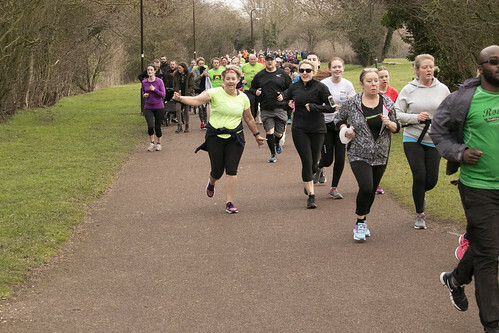 31 people completed their first ever parkrun and an additional 37 completed their first at Milton Keynes. There were lots of local tourists from Ampthill, Banbury, Harpenden and Leighton Buzzard and further afield we had Bracknell and Gillingham. 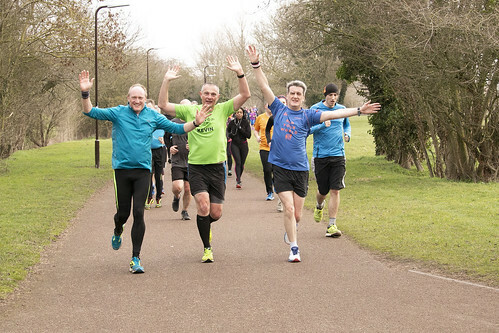 I hope you all enjoyed your Milton Keynes parkrun. We had one junior celebrating his 10th parkrun today – well done to Ollie MALINS. We also had Faye WINSOR collecting her 50th t shirt and Svetlana BLACKBURN and Jonathon WILES collecting their 100th t shirt. Well done to all of you. Daniel WOODGATE (SM25-29) from Luton AC was first to finish in 16.01. This is only his 4th parkrun and he has been first to finish each time. Jamie SEDDON (SM20-24) was second across the line in 16.36 knocking 8 seconds off his PB. Saskia CHAPLIN (JW11-14) from Olney Runners was first to finish in 21.14 knocking 34 seconds off her PB. 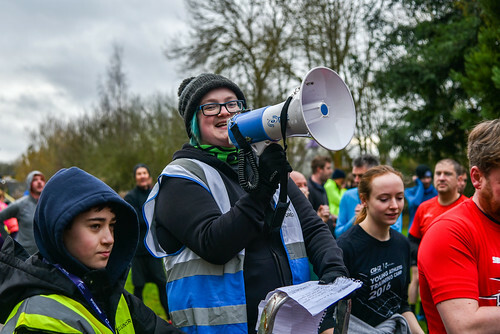 She has managed to get a new PB on 6 out of the 7 parkruns she has completed at Milton Keynes – that is pretty good going! Julie LOXLEY (VW50-54) from Redway Runners was third to finish in 22.47 and has completed 202 parkruns. Milton Keynes parkrun started on 16th January 2010. 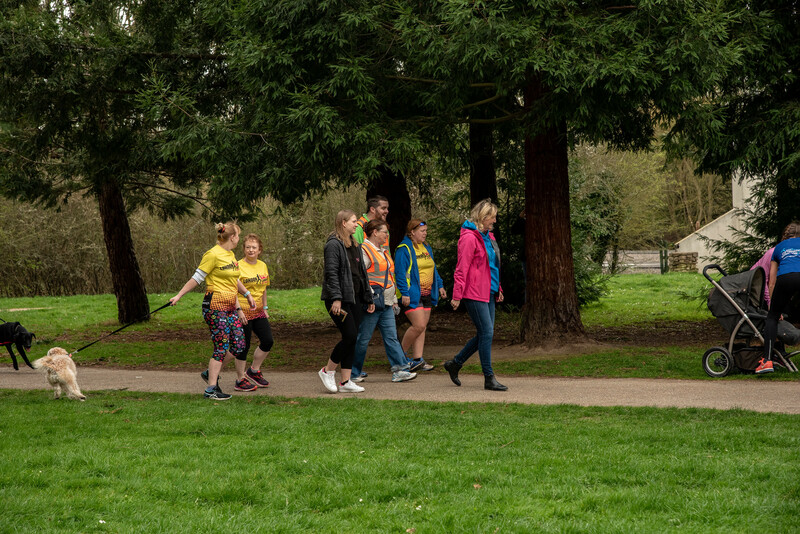 Since then 18,727 participants have completed 167,944 parkruns covering a total distance of 839,720 km, including 28,801 new Personal Bests. A total of 1,856 individuals have volunteered 11,053 times. Today saw our fifth highest attendance with 676 of you turning up to run, jog or walk the course and 47 of those were first timers. It was lovely to see you all. 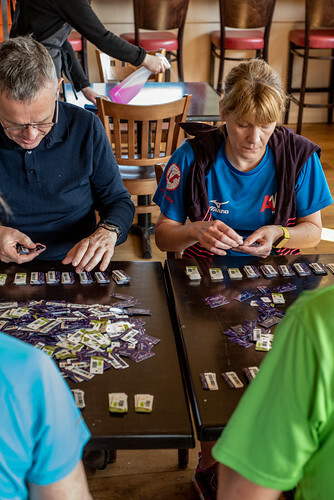 We were lucky to have 18 volunteers from Redway Runners pacing the event with timings varying between 21 and 40 minutes. So who got a PB today? Well it certainly encouraged many of you to try, with no less than 116 PBs being recorded today! So a big thank you all those who volunteered to pace – it really helped!! The only tourist to declare himself came from Lowestoft but I did find another one from Wymondham when I searched the results. As always, there were quite a few more local tourists. I hope you all enjoyed your run with us. There were two juniors celebrating their 10th parkrun – Arun Singh OJLA and Alfie QUARTERMAN – well done to you. We also had four people celebrating their 50th parkrun – Hayley BAYER, Dave KING, Deborah SMITH and Martin WILSON. 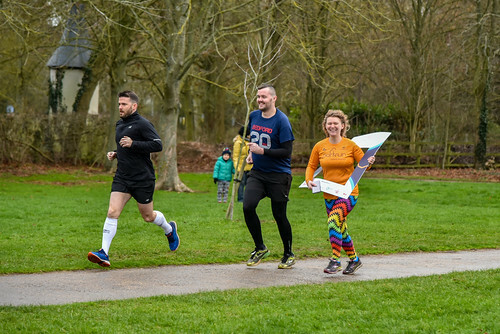 Fiona SIEQUIEN, one of our parkrun directors celebrated her 100th – running the course with the giant parkrun photoframe around her head and finally Mike BELL ran his 250th parkrun today! 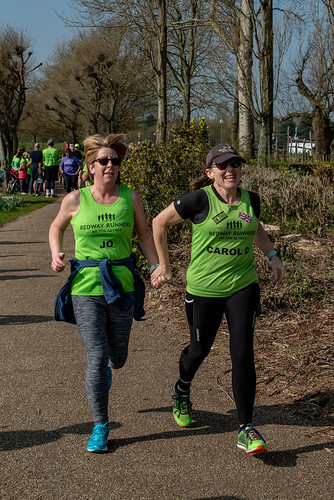 Today’s Run Director was Kaz HYSON who reached her 25th volunteering milestone – not a milestone reached by many – a figure reached by just over 7% of today’s runners. 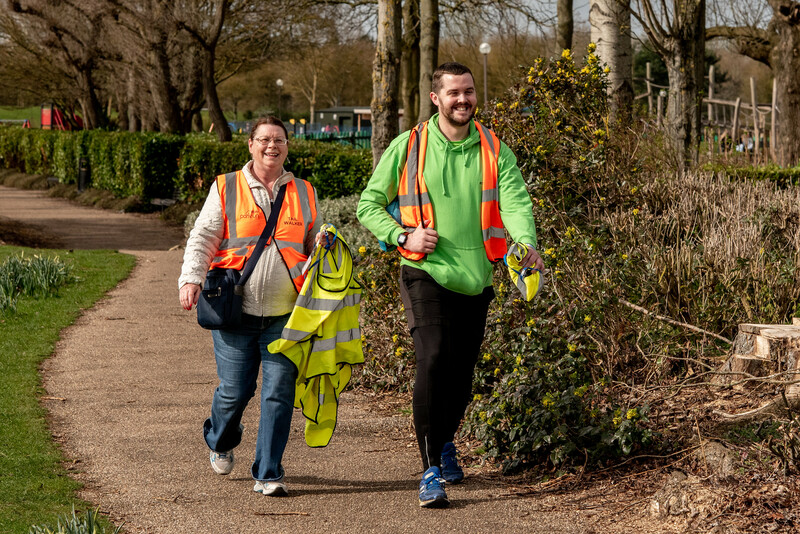 The numbers turning out at Milton Keynes parkrun are growing all the time and this means we need more volunteers to manage the funnel and for barcode scanning so why not consider volunteering just once in a while? Our first finisher today shows as unknown – I do however know that it was Mintu SIDDHU (JM15-17) – all I can say is DON’T FORGET YOUR BARCODE!! 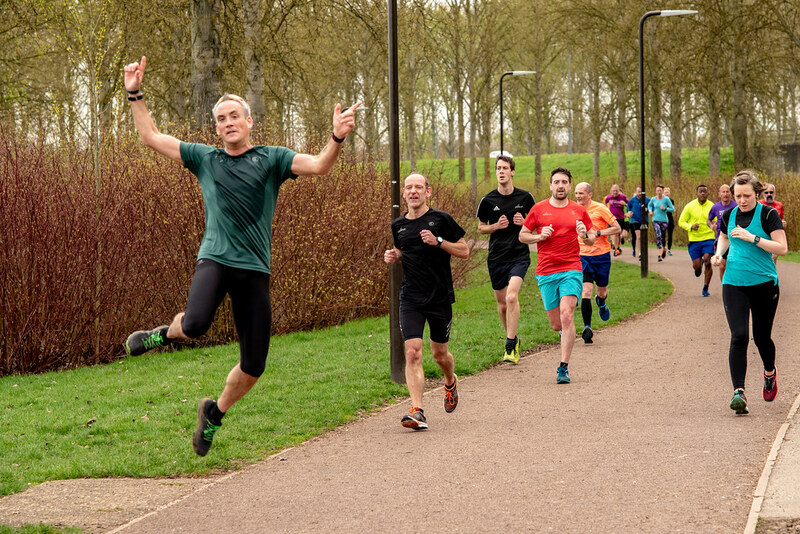 Richard ASHTON (VM50-54) from Marshall Milton Keynes AC was first to finish in 17.09 – only his 5th parkrun and he has always been 1st, 2nd or 3rd finisher – pretty impressive! Saskia CHAPLIN (JW11-14) from Olney Runners was first to finish in 21.48 knocking 17 seconds off her previous PB which she only set last week!! Only her 6th parkrun and second time as first finisher – no stopping her!!! Bronwen TAGG (SW18-19) from Greenlight PT was second to finish in 21.49 knocking 18 seconds off her previous PB set on 1st January this year. Emma RICKARD (SW25-29) from Redway Runners was third to finish in 21.53 knocking 35 seconds off her previous PB which she also set last week!! No caption competition today but look at Gareth’s flying feet!! Impressive. Well done to all who ran today and hope to see you all again soon! This week 676 people ran, jogged and walked the course, of whom 47 were first timers and 116 recorded new Personal Bests. Representatives of 40 different clubs took part. Milton Keynes parkrun started on 16th January 2010. 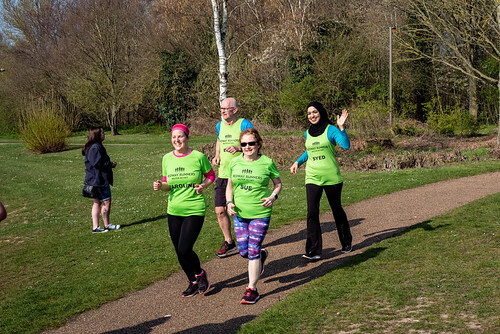 Since then 18,612 participants have completed 166,865 parkruns covering a total distance of 834,325 km, including 28,677 new Personal Bests. A total of 1,848 individuals have volunteered 10,972 times.